Five Star Fencing, founded by Dean+CO, is and has been a 30 year family business in gates and fences. Our aim is–has always been to help homeowners achieve professional-looking results from their home-improvement projects. At Five Star Fencing & Gates, we tackle everything from Automatic/ Manual gates to Timber or Steel front fences, to building your very own gate or fence with our do it your self kits from Five Star Fencing and Gates. Here is some information on planning and designing a fence for your home. Five Star Fencing has been supplying and building hardwood picket fences and steel / iron fences and gates for over 30 years. Referrals List - We have many satisfied customers with all types of fences and we will happily supply you with address of jobs. We specialise in decorative feature fences, either traditional designs, or custom designed timber or steel front fences. This is the Sole focus of our business. We use hardwoods, from timber mills that follow sound forest management practices. Good old fashioned customer service and Practical Advice is our normal way of doing business. 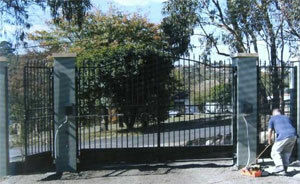 We enjoy helping people to obtain the best result in the construction of their decorative front fence. Do it your Self for those clients who wish to build their own fence we can provide a kit which will minimize any wastage, whilst producing a well designed and good looking fence that will improve the appearance and value of your property. We also manufacture galvanized steel gate frames to your measurements and supply custom made decorative timber features gates to a variety of designs. Call us direct, or fax you details to discuss your needs, we are never too busy to answer questions. Five Star Fencing specialise in providing fences kits to your specification with minimal wastage, a well designed and good looking fences that will improve the appearance and value of your home. Look at the site plan on the left. Take a measurement from point A to point F. This gives us the width of your block. Measure the distance between point B to point C so we know how wide your path is. Do the same for point D to point E for your driveway. Tell us the distance of your path from the nearest boundary (in this case point A to B), the same for the driveway (point F to E). Remember, measure twice, cut once! Double check your measurements to help ensure wastage is minimized and your costs are kept down. Decide how high you want your fence. Then check to see with your local city council if there are any restrictions on the fence height in your area. The Timber we supply for your fence is of the most appropriate quality for the job. However, like all timbers, it can be subject to shrinkage and cracking due to the damaging effects of the sun and other environmental factors. It is therefore very important that you paint your fence immediately after construction! How do I choose the right style of fence for my home? Your fence should suit the style or your home, your personal tastes and your budget. Come in or even fax us, you can also email to discuss your requirements. At Five Star Fencing and Gates, we pride our selves on our customer service and quality advice. What information do you need from me to supply a quote for my Fence or Gate? Take a measurement across your property. Don't forget to measure the width of your drive-way or path. Decide on the height you want for your fence. For metal fences we only use BHP Galvanized Steel. Our timber fences our built from quality hardwood, for example (Spotted Gum, Red Gum, Iron Bark, Jarrah, Merbu, Tasmanian oak). Contact your Council to find out if there are any restrictions on fence construction.